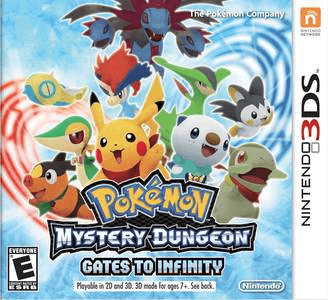 Pokémon Mystery Dungeon: Gates to Infinity is a role-playing game in the Pokémon franchise developed by Spike Chunsoft and published by Nintendo for the Nintendo 3DS. It is the ninth installment in the Pokémon Mystery Dungeon series. Pokémon Mystery Dungeon: Gates to Infinity suffers from minor graphical issues, but is otherwise playable from start to finish. Crashes should not be expected. The game should be expected to run near full speed on modest hardware inside dungeons, but slowdowns should be expected in Paradise and other overworld environments.